As we promised, in this article we are going to tell you new and important advantages that any tournament manageraa has in DoLeague after the 2.6 update, from which we already talked about in the blog. In this new version, the managers have much more freedom in the choices they make when they organize a tournament. Now, they can finish them at any time even when they have still not all results, and reset them even when have started. If the organizer wants, players will change category in the same championship. You just have to go to edit the features of a participant and choice the category you want from the drop. 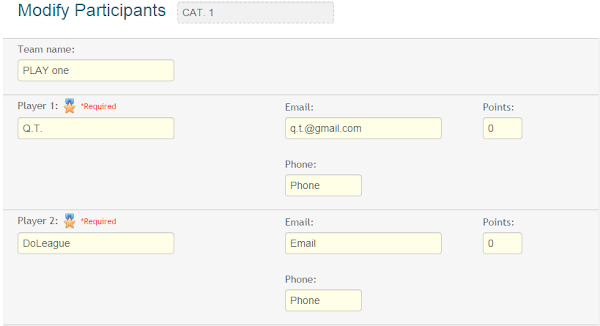 With the registration open, the administrator can edit, add or delete categories. Another advantage for the organizers is they can change tournament key features and adapt them to the needs of the players. As happens in choosing schedules and the date. Now the choice of fixed or free schedules can change as long as the tournament registration is open. Also, dates can change at any time. If you are organizer all of these news help you to create tournaments with more independence and take the decisions more suited to your needs and to the participants requirements.